Middle Tennessee running back Reggie Whatley (25) fumbles the ball as he is hit by Tennessee defensive lineman Jacques Smith (55) and defensive back Brian Randolph (37) in the fourth quarter of an NCAA college football game in this November file photo. KNOXVILLE - At the mention of his new haircut, Jacques Smith flashed a wide grin and ran his hand across his shaven head. 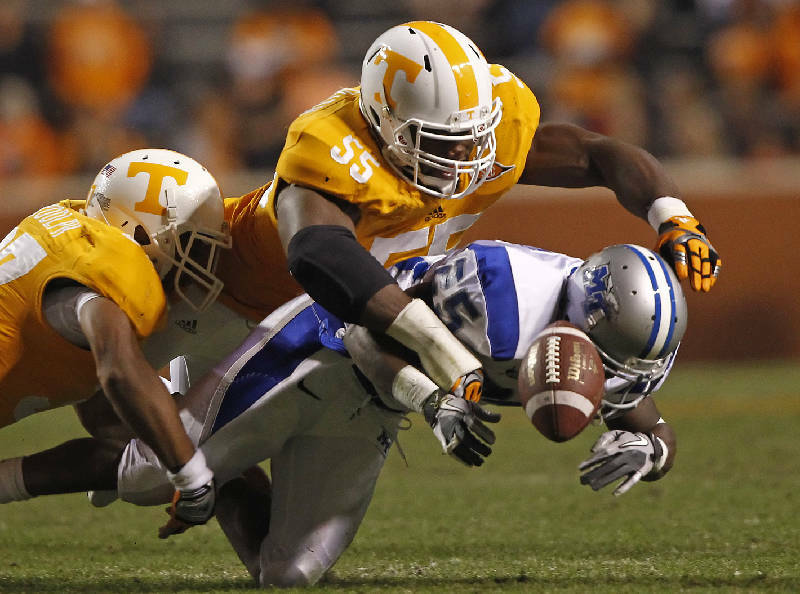 It's a new season, a new position, a new defense and a new look for the Tennessee linebacker. The former Ooltewah Owl hopes the results are new, too. "I'm excited about this team," Smith said last week. "It's probably the most excited I've ever been, and I know we've said that each and every year, but I feel so confident in this team this year and what we've done so far this offseason. We've put in so much work. "Because we've done so much and put so many hours into this, I think it's definitely going to pay off this season." When Smith takes the Georgia Dome field Friday night for Tennessee's season opener against North Carolina State in Atlanta, he'll do it as the Volunteers' Jack linebacker. After playing defensive end his first two seasons, the 6-foot-2, 244-pound junior is now at a key position in first-year coordinator Sal Sunseri's defense. It's a spot on the field that better suits former four-star recruit, but he'll be expected to produce. After a promising freshman season in a pass-rusher role, Smith's numbers took a dip when he became a starter and every-down player. It hurt much more that Tennessee finished 5-7, but Smith readily admitted he didn't meet his own high expectations. He was young, learning on the job and playing out of position. "I was put in a position where I was still learning," Smith said. "At the same time, I still had to go and make plays, and it was hard for me to do that, to learn on the go and be able to go out there and know exactly what offenses were going to give and bring to me and to know my specific job. I think the problem with that was I was a young guy last year. "It was my sophomore season, and I put a lot of expectations on myself, and not only that, I put a lot of pressure on myself and my play." So Smith tried to do too much. He tried to force plays when they weren't there. Tennessee's coaches talked about his need to play more consistently and stay within the scheme. It didn't help that Smith was an undersized end going against offensive tackles who were bigger. That part wasn't fun, he admitted, and it frustrated him. As much as he might have wanted to, he couldn't go to the coaching staff and ask for a change. "I kept doing what I had to do because that's how defenses are set up," Smith said. "Yeah, I could have played a bunch of different positions in that defense last year, and I think they knew that as well. Our defense entitled me last year to be a defensive end, and that's where I was for our team. "I played it every single down as best as I could." Understanding pass-route concepts and learning to drop into coverage have been Smith's adjustments this offseason. The key for him again will be consistency and staying true to his role within the defense. Instead of trying to force plays, Smith must let them come to him. "I think we've seen Jacques grow up a little bit and find it's more than just going out there and him trying to make plays," Sunseri said earlier this month. "It's him being responsible, being on the proper edge, and what he's finding out is when he's on the proper edge and everybody else is, balls usually bounce to him. He's done a real nice job." The switch to the 3-4 defense might have benefited no Vol more than Smith, who is more effective when playing in space. As with a number of other players in the front seven, Smith's role may depend on the situation. Amid the high number of formations, packages and personnel groupings in the Vols' defense, some scenarios fit Smith better than others. "I think Jacques has really shown a lot of what his strengths are in mainly sub stuff, when he's in there in more of a spread setting," head coach Derek Dooley said. "[When] the plays get a little looser, he's got a lot of real quickness and twitch where he can disrupt an offense. Where it gets tough on Jacques is when they tighten it down and big bodes are double-teaming him because he's not as big." Smith said he knows it's a "huge" year for him. Yet he says he's putting less pressure on himself. In fact, his approach disregards anything about his own play. "There's no expectations at all," he said. "I'm not expecting anything but to win, and I really don't care about any stats that could factor on my side. I'm more focused and more on our team rather than any individual goal that I could obtain this year. "I just feel comfortable. I feel like I've done this before, and I feel like it's nothing new. The only thing that's new is our defense, and I'm excited about going out there and showing everyone that we know our defense and we can run it well." That'd probably make him smile, too.